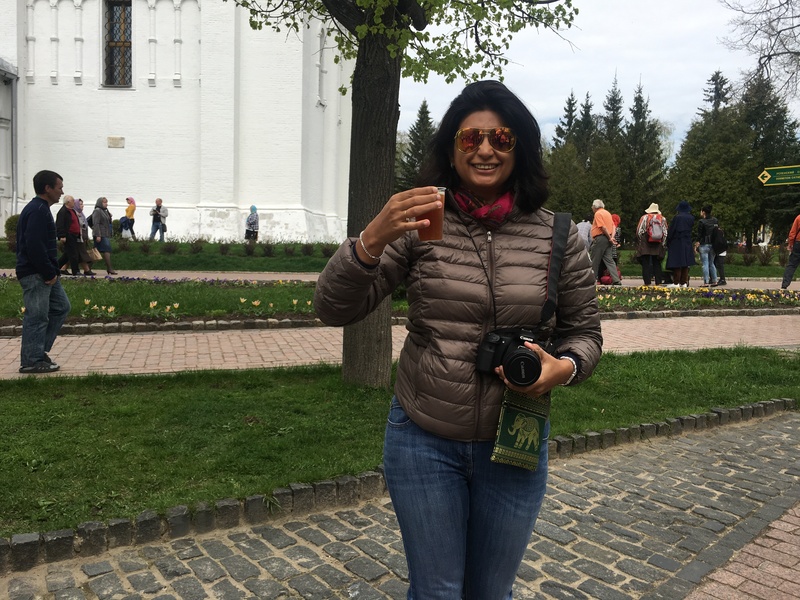 When I was chalking out the itinerary for Russia, my intention was to explore the entire itinerary for Russia, which is a ring of about seven cities located in the North East of Russia. These cities are: Vladimir, Suzdal, Kostroma, Yaroslavl, Rostov-Veliky, Pereyaslavl-Zalessky and Sergiev Posad. 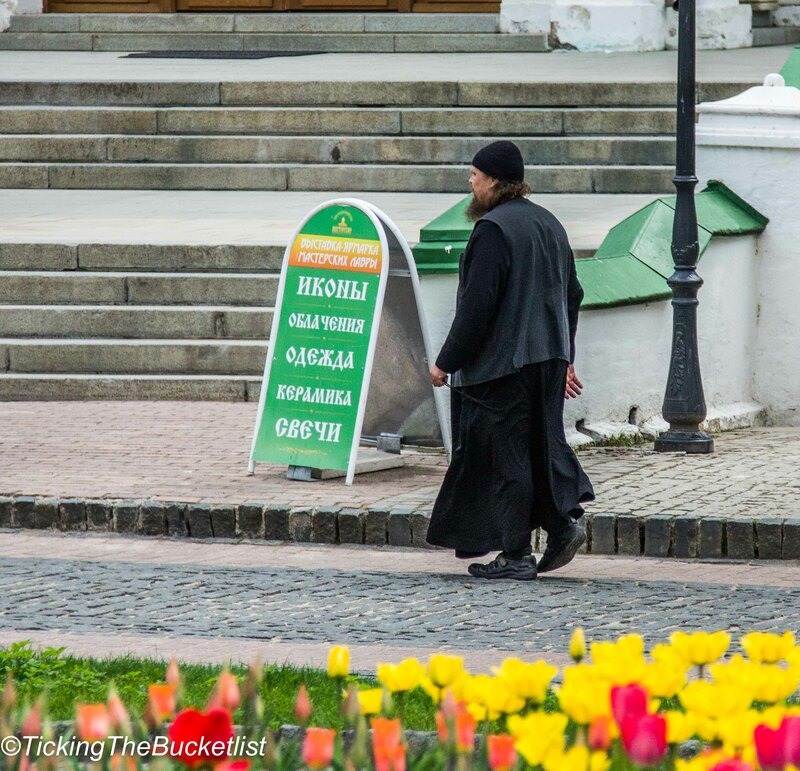 The entire route is like an open air museum and each of these towns houses churches and monasteries that have played a significant role in Russian history, including formation of the Russian Orthodox Church. However, visiting each of the above listed towns along the route required at least 4 days while I had just a week to spend in Russia, in which I intended to explore Moscow and Saint Petersburg, both. Hence, I dropped the idea of touring the entire Golden Ring and chose to visit Sergiev Posad, the city that is the closest to Moscow and can be explored in 6 – 8 hours. The minute you land in Russian, you will notice the dominance of Cyrillic i.e Russia script. All signs and advertisements, except those on the international airport are in Cyrillic. Language is quite a barrier and not many people know English. Hence, finding your way around by asking strangers is not an easy task. Also, as the reputation has it – not many people want to talk to ‘strangers’ ie tourists. All this made me believe that it would be best to explore Sergiev Posad on an organised trip, along with an English speaking guide…and I am so glad that I did so. It was great to have a guide who could share stories about the buildings and customs…there were no signs to understand any of this and I would have been totally lost had I gone alone. Sergiev Posad is famous for Troitse-Sergiev Monastery, which is the spiritual home of the Russian Orthodox Church. 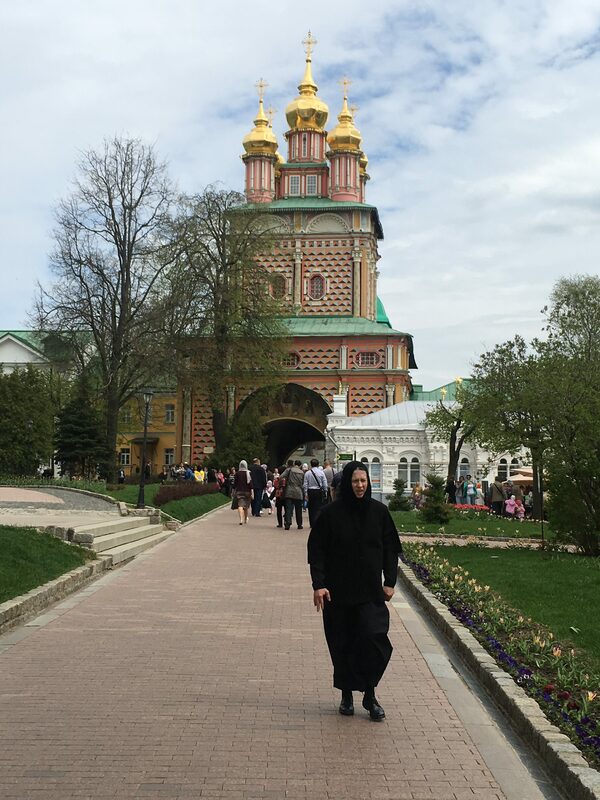 There are plenty of churches to see in the complex, including the monastery founded by St Sergius, which dates back to the 14th century. 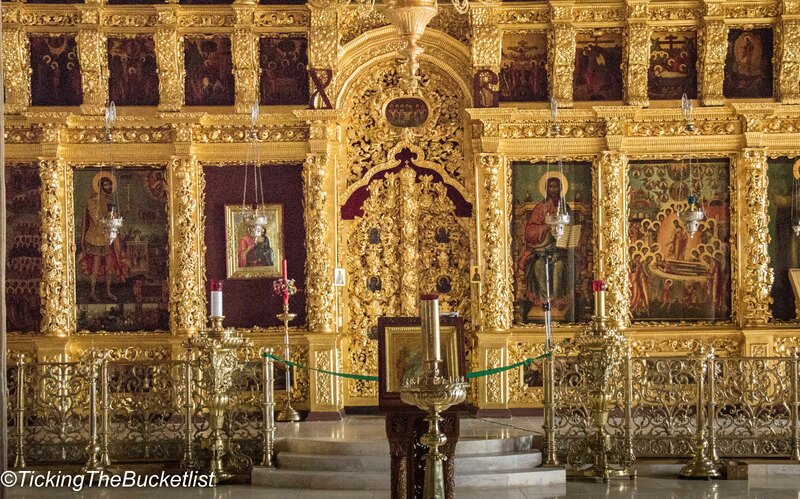 Relics of St Sergius are still preserved in the church dedicated to the Holy Trinity, which was built in the 15th century. There is a long line of believers to offer their prayers at this church. However, the line for tourists is different. Remember that the line for tourists allows you to observe the altar only from a distance and does not let you become a part of the prayer ceremony or light candles. Another stunning cathedral is the Assumption Cathedral, with the gilded cupolas. 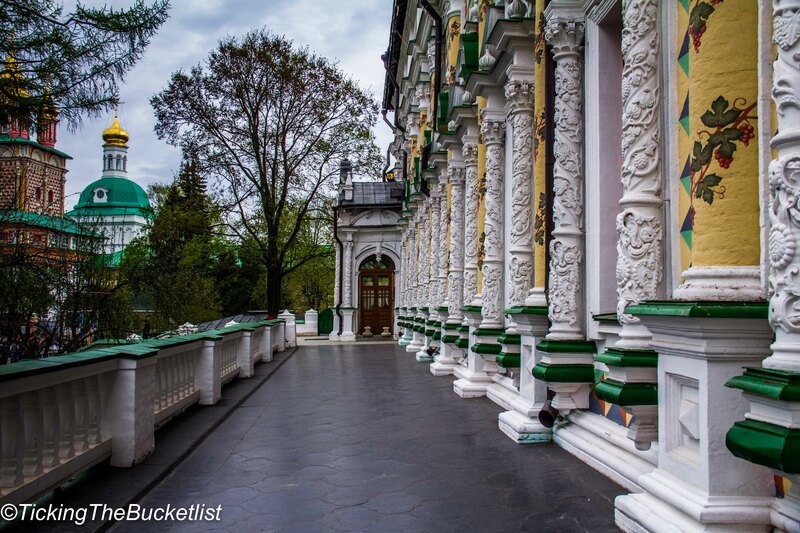 The cupolas shine and say stories of Russia’s rich past. The interiors, adorned with violet and blue frescos are breathtaking and make a visit to the cathedral worth your time. Sergiev Posad is about 80 kilometers from Moscow City Center. However, thanks to the terrible traffic situation in Moscow, it take about two hours to get to the site from Moscow City Center by road. All organised tours to this town take the bus and hence, 4 hours of the tour are spent en-route. Another alternative is to take a train and get to Sergeiv Posad, in case you choose to visit the town on your own. You can take the direct train from Yaroslavsky Railway Station (Komsomolskaya Square) to Sergiev Posad. There is a meal that is served in the monastery twice in the afternoon, which is a vegetarian spread. 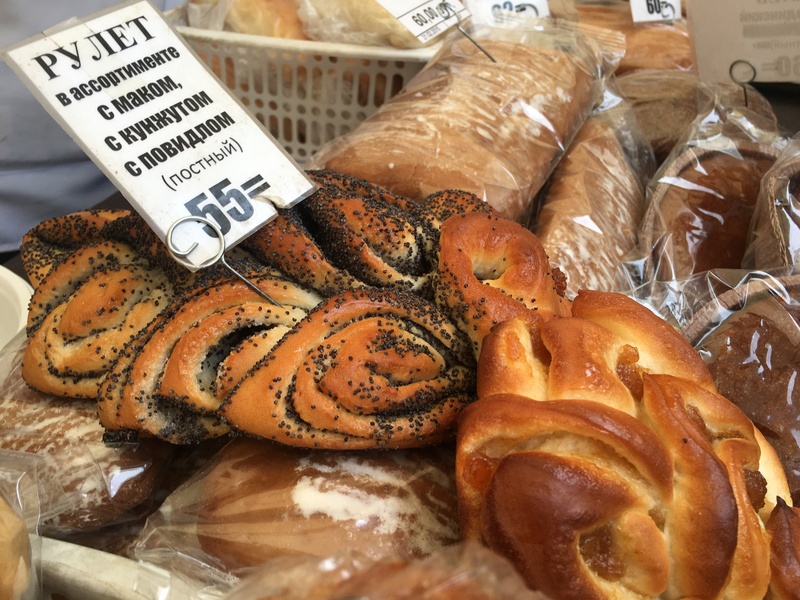 If you miss the times, do not despair – there is little bakery counter at the entrance which serves some yummy breads. I had a pizza like flat bread and a sweet poppy bread, both of which were delicious. I had an interesting local drink inside the monastery complex… it tasted like beer, sans the alcohol. Give it a shot if you can lay your hands on it…travelling is all about experiencing a place in its entirety, isn’t it? Sergiev Posad is the birthplace of the Matryoshka dolls. Obviously, this is the best place to buy them! There are a few stalls and shops just outside the monastery complex that sell some fine dolls, with really fine painting. The products are of good quality and very well priced. You can bargain a little, but the maximum the seller typically budges is 15%. Often, you will be able to buy the doll from the artist himself/herself. There is no entrance fee for accessing the monastery or any of the churches. If you do decide to visit the museum, you will have to buy a ticket for the same. As mentioned above, I would recommend visiting Sergiev Posad on a organised trip or with a local, who can tell you a little about the history of the complex and the local customs and traditions. My tour lasted about 2 hours, including the 2 hour travel time each way. I spent about 2 hours inside the Sergiev Posad complex, which seemed lesser than what the place deserved. Ideally, I would like to budget at least 3 hours for the place in order to explore the churches from the inside as well. In case you are in Moscow and have a day to spare, visit to Sergiev Posad is a great idea. I felt at peace here…something about the place calmed my mind. Now, I want to visit all the towns and churches on the Golden Ring. Fingers crossed and hoping that I return to Russia soon to tick this item off the bucketlist. Russia is always on my wishlist and very few blogs I have seen on it. It is great you always give nice information on this part. I have seen churches and beautiful monasteries of neighboring countries of Russia so I can figure out here also it must be a beautiful experience. Do we have to cover head in church there? I am amazd to read that we get vegetarian spread in afternoon there as i am totally vegetarian. Locals cover their head.As tourist, we dont have to…but I would rather cover my head and respect local culture. I had not even heard of Sergiev Posad. Giants like Moscow often overshadow little gems such as these. I am so delighted to know that there is a vegetarian spread in the monastery. I am a vegetarian (not vegan) and am most worried about the food when I am traveling to foreign countries. Sergiev Posad is very famous on the tourist circuit. Btw…vegetarian food was very easy to find in Moscow…lots of Indian restaurants as well. So glad to know about Sergiev Posad . Russia is yet to happen in my life. And when it happens I intend to visit this place. I like old cathedrals and knowing the beliefs surrounding them. There seems to be lot of photo opportunity too. This place breathes culture and tradition…you will love it! I agree with personal tours and how they are soo much better! you get to find out great stories and bits of history about the location yous are in! Great article and its making me want to take a trip to Russia! You must visit Russia…its isnt too expensive these days! Haha I was totally into Russia, The Trans Siberian Train Journey and planning my next trip this evening and now reading your post! Seems like a perfect day trip from Moscow. And I agree with you that you’ve to try new food when you are in a new country because it’s one of the best ways to learn about a new culture. The beer-like drink is something I’d surely try. It’s architecture like this that makes me want to visit Russia. It is so stunningly beautiful. I agree that I would want more than 2 hours as well to take it all in. I tend to get lost at the best of times, so I like the idea of doing a tour here. The tour is a great idea as not much is written around and knowing what is what is a challenge..its great to have an english speaking guide! Sergiev Posad seems like a beautiful place to visit. The colours of the buildings are so cheerful. Russia is still on my bucket list but this is a great combination with Moscow. 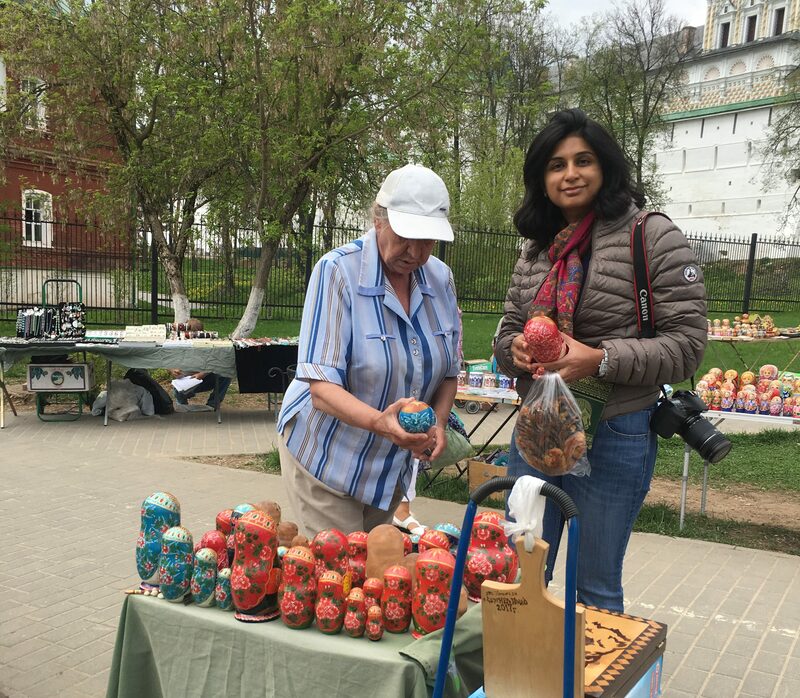 It is a must do day tour if you are in Moscow…not touristy…you will see the locals practising their traditions! The architecture looks spectacular!!! Reminds me of the St.Basil’s Church in Moscow! A day trip is just perfect! It would be better than the touristy places! Indeed a lesser known gem! Great place to visit. Thank- You for sharing this informative post with us. Loved it. Pictures too are amazing. Love Russian Architecture, looks so majestic. Oh! and the vodka too, would love to experience Russian Vodka. It was truly a magical place. I was spellbound and top of it first snowfall of my life happened in Sergiev Posad.